An author and retired civil servant takes up cudgels with do-it-yourself guru Shiv Khera. Accuses him of blatant plagiarism, settles for lakhs. It was a flattering offer for the retired railway official and author of two small forgotten books when management guru and million-copies-selling author Shiv Khera invited him to work together last month. Just what he meant by "working together" struck 70-year-old Amrit Lal only when he was out of Khera's posh condominium in Singapore. 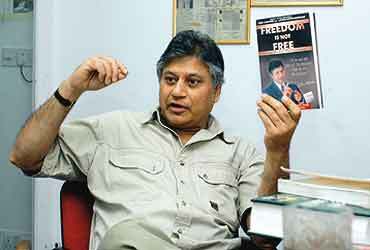 Flicking through the book Khera had given him as a parting gift, Freedom is Not Free, Lal discovered sentence after sentence lifted from his own book, India—Enough is Enough, published nine years ago. "It was like seeing a priest coming out of a whorehouse," is how Lal decribes his sense of outrage at the "lift and shift robbery" by a man whose self-improvement bestsellers like You Can Win and Living With Honour have been translated into four Asian and nine Indian languages. All night, Lal scoured through the 223-page book Khera had gifted him with a personal inscription "To Mr Amrit Lal—Let's together make the country proud." He discovered, to his rage, at least 34 instances where sentences and even paragraphs from his own book—a 177-page crusade against corruption—had been lifted almost verbatim. "Even an acronym I had coined, RNI, he has stolen as a subtitle. I had used a verse by Iqbal in my book which Khushwant Singh translated specially for me into English. Khera passes it off as his own. Nor is it a coincidence that the only other poem I used in my book—Joshua Holland's God, Give Us Men—appears in his book as well, again without acknowledging the poet." Lal confronted Khera with the evidence he had dug up. In a letter he e-mailed the next day, Lal wrote: "I went through your book Freedom Is Not Free at one go and find surfeit of scissor-and-paste work from my book India: Enough is Enough." "I give below page wise, para wise account of lift-and-shift craftsmanship. (He gives 34 instances)." Khera's response to this missive was silence. Lal then dashed off an e-mail to Khera's publisher, Rajiv Beri of Macmillans. That too did not draw a response. A week later, Lal followed it up with another letter to Beri claiming that even the title of Khera's book had been lifted from that written by Ralph M. Hockley (Pub. Brockton, Copyright: Jan 31, 2001—ISBN 188791840xx). Clearly he meant business. Beri's reply came almost instantaneously: "Dear Mr Lal, On receipt of your earlier email I had contacted my Delhi editorial to look into this as it came as a complete surprise. I am also forwarding your mail to Mr Khera who as the author is best equipped to respond to you." With the publisher washing his hands of the affair, (when contacted, no one from Macmillan was prepared to comment), Khera had no option but to talk to his tormentor. Says Lal: "He called me on June 18, saying how much he respected me and that I was like his elder brother. All he'd say about my letter was: what do you advise me to do? He offered to acknowledge the facts and give credit for taking the lines from my book. But I kept telling him I wanted a line-by-line reply to my letter." Khera agreed to reply to Lal's allegations within six days. It took 12 days, and it was what Lal calls "a lawyered document." In the letter, CCed to his publisher, Khera categorically denies Lal's allegation of plagiarism, saying, "as a matter of habit, I make notes of ideas and concepts that come to mind, which can be developed further.... Many examples, and anecdotes are the result of a collection from various sources over the last 25 years. Unfortunately, the sources were not always noted or available; hence it became impractical to provide an accurate acknowledgement." But there was a small conciliatory gesture to Lal: "Having said so, I appreciate your having brought to our attention some sentences from your book for which giving a credit escaped our attention. It may have been totally an oversight and without prejudice. Since you have brought the same to our attention, I shall acknowledge and give credit to you in our next edition." Khera concluded with the hope that "with this, the matter should come to rest. I look forward to a great relationship in the future." It was a hope destined to die. Lal's response was to both go public and approach a lawyer in Delhi. "Khera has filed a caveat in court so I sought legal help," he explains. When Outlook contacted Khera in Delhi, he explained how these "lapses" occur: "It is not possible to acknowledge all the sources in my book, there are far too many." Khera summoned one of his team of "researchers," who explained: "My job is to input into the computer the newspaper cuttings that Sir gives us. Sometimes there is an oversight and we forget to put the date and name of newspaper." But 34 instances from the same book? "There is no copyright on either titles or individual sentences, unless you patent them as your trademark," Khera asserts. "Borrowing from many sources and creating a new work is absolutely not an infringement of copyright." But how do you create a new work, counters Lal, when most of the book is borrowed material. "Even in his bestselling You Can Win, it's 73 per cent anectodes and jokes (82 anecdotes, almost all of them unacknowledged, in 290 pages). The rest is quotes (90) and one-liners and poems (13) of which five are not acknowledged." What shocked Lal was Khera's negligence about readapting the material he had pinched. References to Americanisms like prairie chicken, Hudson River, Calgary Towers, Harvard University studies pop up at regular intervals, and at one place, as Lal points out, Khera even refers to America as "our nation." Rs 25 lakh as compensation. It's a sum handsome enough to send other writers scurrying to pick up Khera's books in the hope of finding more such lapses.